The Internet of Things (IoT) is ushering in a new era of connected homes, smart appliances, and other developments beyond our imagination. Technology companies and government organizations are working to enable the necessary infrastructure for its promised availability in the early 2020’s. Over the past decade, 4G wireless technologies resulted in a 4,000-fold increase in data traffic. Mobile data is growing at a 47 percent compounded annual growth rate and 5G will expand leaps and bounds beyond its predecessor. With expected speeds 100-times faster than current networks, 5G could allow consumers to download a full-length, high-definition movie onto their phone in seconds. However, the current infrastructure would struggle to support the demand. 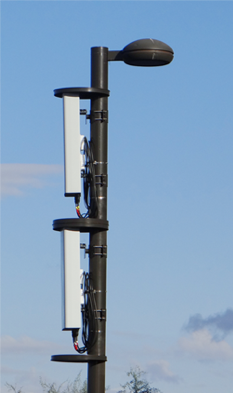 To lay the foundation for the next leap in wireless connectivity, providers are supplementing macrocellular towers with much smaller, and portable cellular base stations called small cells. These are smaller than traditional towers or rooftop installations; they may be as small as a television remote-control but are typically the size of a pizza box or briefcase. Their size makes them easy to install inconspicuously on existing right-of-way infrastructure like street signs, telephone poles, or streetlights. Small cells help boost cell tower signals and create better coverage indoors and in remote areas by locating wireless antennas closer to ground level, where users are located. Multiple nodes can deliver more capacity to the same geographic area than one traditional tower would typically cover. 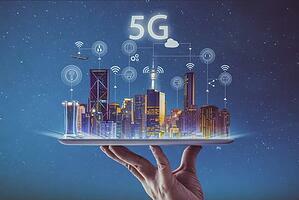 To support 5G technology, the Federal Communications Commission expects that we will require “a 10 to 100-fold increase in small cells and millions of miles of new fiber and other network infrastructure.” Rapidly growing requests for small cell and other attachments are creating new engineering, operational, and administrative challenges for joint use organizations. Illustration depicts small cell technologies. 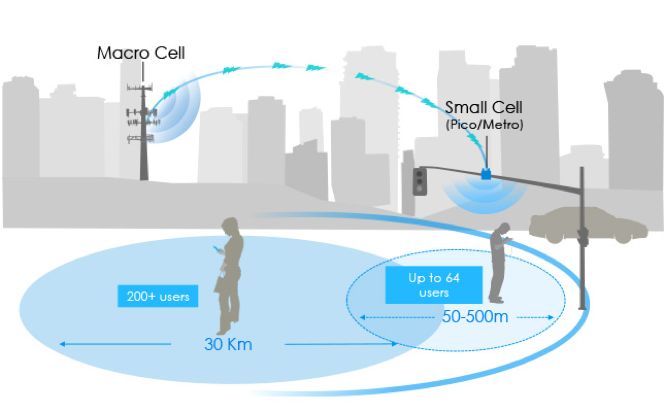 Illustration depicts what small cells look like on pole. Installing small cell wireless infrastructure improves the network and immediately benefits the community. To support small cell equipment, providers will need to supplement existing infrastructure with new poles to house the appropriate power and connectivity. Climbing accessibility: Wood poles must be possible to climb. New equipment must be installed on the same side of the pole as existing equipment. Minimum clearances: The standard clearance is 40 inches between the lowest power attachment and the uppermost communications attachment. For antennas placed at the top of a pole, they must have 5 feet of clearance above the uppermost power conductor. Attachment guidelines: The pole owner specifies how equipment must be attached and positioned onto an existing pole. Carriers must collaborate closely with local municipalities and utility companies when attaching small cell equipment to poles. While the ideal process would be uniform, the reality is that every city has its own process for community engagement, concealment, pole attachment, and additional variables. Due to the lack of a scalable deployment process, the number of small cell sites has long-lagged projections. The demand for more data and faster wireless service continues to grow and 5G is coming whether we are ready or not.